Since after the forced amalgamation of Nigeria and the independence thereafter, Nigeria has witnessed several transitions of government from the military to military, from the military to civilian and from the Civilian to Civilian administrations. Irrespective of the ills associated with each administration, there has not been any time in the history of Nigeria that Nigerians have been so deceived and manipulated such as this time. No history known to me in any part of the world where a dead President was duplicated or cloned and installed to continue functioning as if he is alive. This is the wonders of our time and is happening for the first time in Nigeria. This high-tech fraud meted against Nigerians has gone down in history, a world class deceit that generations of Nigerians will live to remember. Maj. Gen. Mohammadu Buhari (rtd) contested an election in 2015 and won even when the international observers of that election openly confessed that the election was characterized by massive rigging and under aged voters yet the result was accepted and the incumbent President, President Goodluck Ebele Jonathan peacefully handed over power to him on May 29th 2015. Few months later, Mr President was flown abroad for medical treatment. Several months was spent waiting for the recuperation of Mr President but as fate would have it, President Mohammadu Buhari died following a major brain surgery. The news of his death filtered in but was immediately blocked and all information about his death was debunked by the Nigeria media. He was laid to rest in Saudi Arabia on the 27th of January 2017. We must not forget that similar incidence happened to President Musa Yar’adua. The Former President who ruled Nigeria from 2007 to 2010 died on May 5th 2010 after a protracted illness in a hospital in Saudi Arabia. After much intrigues and power play, late Prof. Dora Akunyili, the then minister of information announced his death. Consequent upon the announcement, Prof. Dora Akunyili later died and her death was attributed to the announcement which the then cabal do not want to make public. It was rumoured that Dora Akunyili was poisoned and she died as a result of that; but the information emanating from the hospital said that she died of Cancer related illness. 3. Islamisation of the Social, Public military and Paramilitary spaces in Nigeria. This is the reason the Hausa/ Fulani cabal wants to hold on to power and the “Born to rule’’ mentality been brandished. Chief of Staff (COS) to the President- Abba Kyari, who was said to have initiated the idea. Ø Former Director General DSS – Lawal Daura. Ø El- Rufai Kaduna state governor, a religious fanatic. Ø The DG of Nigeria Ports Authority – Bala Usman. The cabal has inexhaustible and unfettered access to the National purse. That is why it will not be wrong to add some of these people. They bring any amount in cash as at when needed. Mrs Halima Hadiza (the minister of finance) is represented by El-Rufai and other proxies. It is to have an unfettered access to the needed funds that Kemi Adeosun - former minister of finance was removed with NYSC fake certificate charge to get rid of her when they were no longer comfortable with her. Another reason for the cabal idea of cloning Buhari is the past experience they had after the death of Alhaji Musa Yar’adua. They felt they lost their tenure and power to the south and do not wish it happens again. Their disgust was not hidden during the handing over to the then vice president Goodluck Ebele Jonathan. The political intrigues that played out was a deliberate plan of the cabal to unconstitutionally retain power. The quickly intervention of National Assembly by the introduction of the ‘doctrine of necessity’ was what put the matter to rest. Even at that, President Jonathan did not have it rosy during his tenure. The cabal made sure that they frustrated him. When President Muhammadu Buhari was declared been in ‘’vegetable state’’ the cabal began to hunt for a replacement to cover the shame and loss of power again to the south. The health condition of Mr President was compounded by the curse laid on him by Onyendu Mazi Nnamdi Kanu. When late Buhari was alive he boasted that ‘’ over his dead body would he ‘allow Biafra to go’ Mazi Nnamdi Kanu answered in affirmation. few weeks later, he died in a London hospital and was buried in Saudi Arabia. These are the reasons why the cabal took this dangerous and self-destructive step. They would not allow their turn to be completed by Western (Yoruba’s) as was in the case of Musa Yar’adua even when the constitution was very clear in the matter; that the vice President should take over when the President is in-capacitated but because they do not obey the law, they went ahead to cause a constitutional breach until the National Assembly intervened. 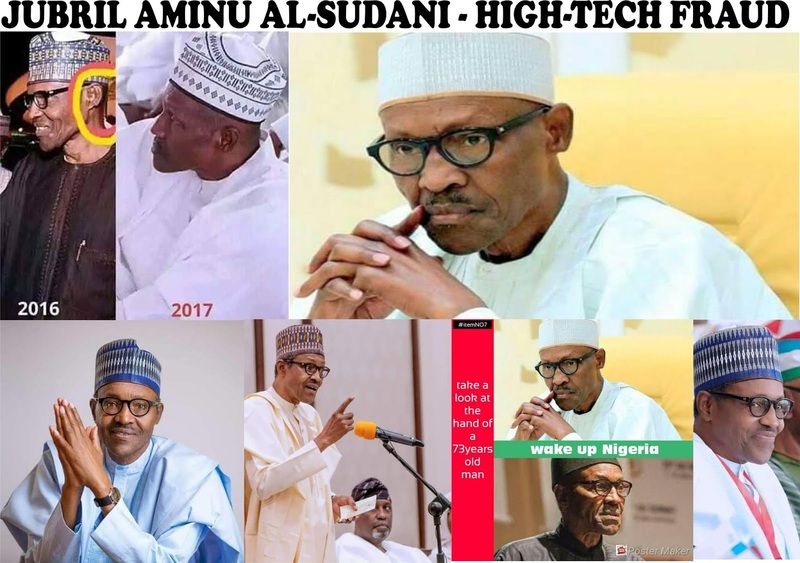 These wicked souls from hell, imported Jubrin Al-Sudani, a Khartoum based stage actor to impersonate the dead Buhari through the help of an immigration attaché at Nigeria mission in Khartoum-Sudan called Habibu Almu. After the procurement of Jubrin, Habibu Almu was killed in Sudan immediately the deal was sealed in Abuja. The Sudanese Police spokesman, Omar al-Mokhtar said Almu was stabbed to death but ruled out terrorist attack. Reuters cited al- Arabiya television of Dubai to have identified the diplomat and described his death as an ‘’Assassination’’. The role played by Britain in this whole imbroglio in Nigeria cannot be ignored. It was in Britain Late President Mohammadu Buhari went for medical treatment. It was in the same Britain he died and was flown to Saudi Arabia for burial. It was also in the same Britain that Jubrin was cloned into living Buhari. Britain is a long ally to Hausa/Fulani who protect their interest in Nigeria. Simply put, Nigeria is British investment and would not allow their investment to crumble. This is why they have refused to let Biafra go. Today, Jubrin Al- Sudani is parading himself as Mohammadu Buhari the President and commander in chief of the federal republic of Nigeria. It is most unfortunate that this clown called Jubrin of Sudan enjoys all the paraphernalia of Mr President even the Vice President who is aware of this intrigue still refers to him as Mr President, a foreigner. As we keep doing the needful, unmasking the lies behind Jubrin and the cabal in Aso rock, we call on the international communities and men and women of integrity in Nigeria to rise in defence of truth. We the Biafrans make bold to say, we do not want to remain in this unholy marriage anymore. Biafrans are naturally born truthful and peaceful people and cannot live with people who do not regard the sanctity of life and shameless in all they say and do. Nigeria as a country is irredeemable and must go her separate ways.